This amazing inflatable double water slide is great for promoting friendly competition or group challenges, kids can climb together up the center climb of the water slide, and then choose a left- or right-sided slick water slide. Double the Fun, Double the Excitement, Double the Splash! 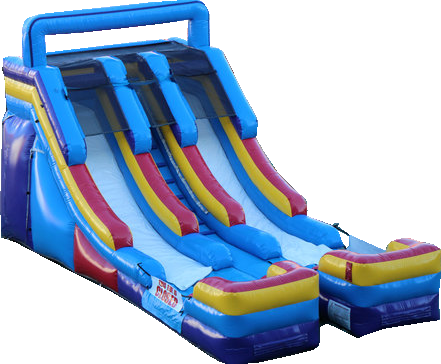 Our double lane inflatable water slide it's a great option to cool down your guest a hot summer day, add a dunk tank and interactive games, for an amazing party... and don't forget that we also have tables, chairs and concession machine rentals. The rental price of this water slide is $325. Please call the office for availability.